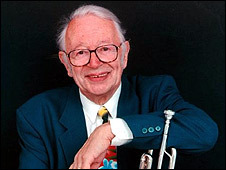 Veteran jazz musician and radio host Humphrey Lyttelton has died aged 86. The chairman of BBC Radio 4's comedy panel show I'm Sorry I Haven't A Clue recently had surgery in an attempt to repair an aortic aneurysm. The latest series of the quiz programme was cancelled after Lyttelton was admitted to Barnet Hospital in north London on 16 April. BBC Director General Mark Thompson described "Humph" as "a unique, irreplaceable talent". Lyttelton retired from hosting Radio 2's The Best of Jazz last month after more than 40 years presenting the show. He hosted I'm Sorry I Haven't a Clue - the self-styled "antidote to panel games" - since 1972, appearing alongside regulars Graeme Garden, Barry Cryer and Tim Brooke-Taylor. In 1993, he received a Sony Gold Award for services to broadcasting. 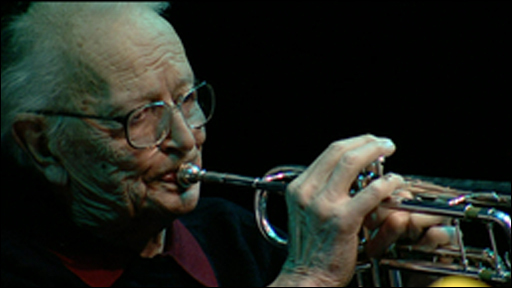 Lyttelton began playing the trumpet in 1936 and was still touring with his band up until his admission to hospital. Best known for the song Bad Penny Blues, they became the first British jazz act to enter the top 20 in 1956. He was honoured with a lifetime achievement award at both the Post Office British Jazz Awards in 2000 and at the first BBC Jazz Awards in 2001. The BBC's Mark Thompson said Lyttelton would leave an "enormous gap" in British cultural life as a whole and in the lives of many millions of listeners. "One of the towering figures of British jazz, he excelled too as a writer, cartoonist, humorist and of course as a broadcaster on television and radio," he said. "On I'm Sorry I Haven't A Clue all of his gifts were on show, his warmth and conviviality, his wit, his mischievousness. "He was a unique, irreplaceable talent. Like his many fans, we owe him an enormous debt of gratitude. Like them, all of us at the BBC feel a tremendous sense of loss." The controller of Radio Four, Mark Damazer, said Lyttelton encompassed "so many" of the virtues people wanted from Radio Four comedy. "He's just a colossally good broadcaster and possessed of this fantastic sense of timing," he said. "It's a very, very sad day but we should celebrate and be very grateful for how much he did for Radio Four because he really was one of the giants over the last 40 years, really terrific." Jenny Abramsky, BBC Director of Audio and Music, said he had been "one of the wonders of radio broadcasting for years". Jazz trumpeter Digby Fairweather said that Lyttelton "was, in the best possible way, a jazz machine". "We will probably never have another Humphrey Lyttelton, which is terribly sad really," he added. "But we can always play his records." You can hear a classic edition of I'm Sorry I Haven't a Clue on BBC Radio 4 on Sunday 27 April at 1200 BST. There will also be a special programme in tribute to Humphrey Lyttleton on Wednesday 30 April at 0900 BST.